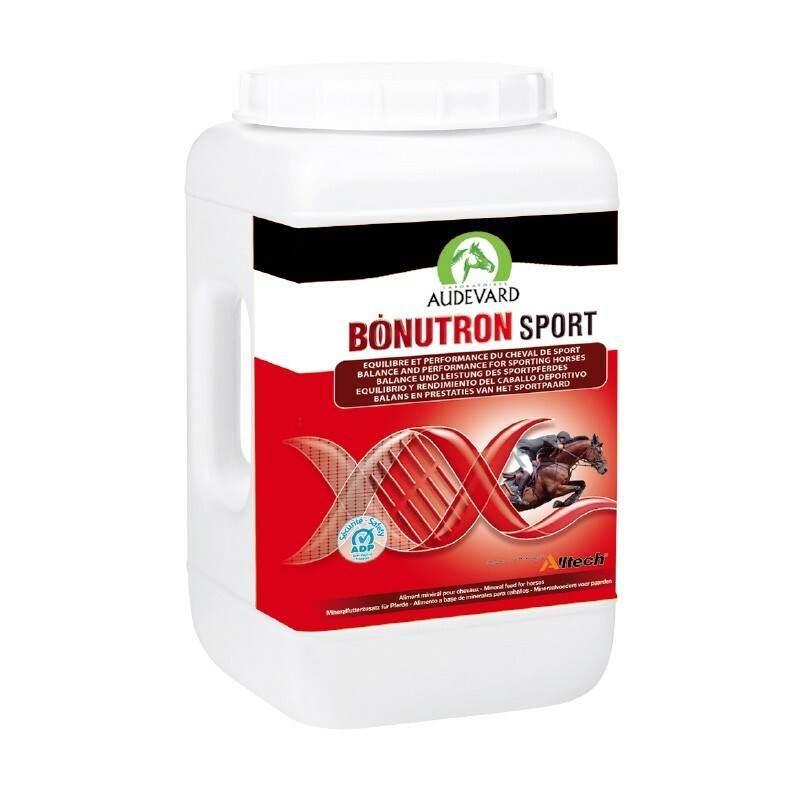 With 29 nutrients, the BONUTRON SPORT formula is ideal for sport horses undertaking intense exercise requiring precision (show jumping, eventing, dressage etc.). By buying this product you can collect up to 48 loyalty points. Your cart will total 48 loyalty points that can be converted into a voucher of 14,40 €. As with humans, the choice of daily food is the first aspect that should be considered when optimising a horse’s health and performance. Feed does not provide all the micronutrients needed for a horse’s metabolism. Supplementation therefore plays an essential role in minimising the natural imbalance of horse feed. With 29 nutrients, the BONUTRON SPORT formula is ideal for sport horses undertaking intense exercise requiring precision (show jumping, eventing, dressage etc.). It provides essential antioxidants and amino acids in addition to the usual BONUTRON ingredients. For more than 30 years, the BONUTRON brand has been supplementing the feed of the greatest champions, providing micronutrients essential to their metabolism, based on their age and activity. BONUTRON SPORT users like the fact that it is easy to use. In a single step, it provides the micronutrients horses require during periods of increased activity. Plan ahead for periods when nutritional requirements are increased. Start administering three to four weeks in advance, so the horse can build up reserves. 1.5 kg tub. Sufficient for up to 30 days' use in adult horses. 3 kg box. Sufficient for up to 60 days' use in adult horses. 9 kg tub. Sufficient for up to 180 days' use in adult horses. 20 kg barrel. Sufficient for up to 400 days' use in adult horses. Nutritional support formulated for horses producing regular intense effort (show jumping, hunting, dressage etc.). Daily allowance: 1 level measure per horse, per day. For very intense work or in cases of increased stress, the quantity can be doubled for 2 weeks, or BONUTRON ENDURE may be recommended. Raw materials: dicalcium phosphate, calcium carbonate, whey, molasses, sodium chloride, magnesium oxide, soya meal, grape seed powder ; Additives : 3a- Vitamins, provitamins and substances with analogous effect: L-carnitine 10,000 mg, E300 vitamin C 6,000 mg, 3a890 choline (chloride) 4,000 mg, 3a314 niacin 2,500 mg, pantothenic acid 1,300 mg, vitamin B1 1,060 mg, vitamin B2 920 mg, 3a831 vitamin B6 420 mg, vitamin K3 275 mg, 3a316 folic acid 260 mg, biotin 30 mg, vitamin B12 8 mg, E672 vitamin A 1,100,000 IU, E671 vitamin D3 60,000 IU, 3a700 vitamin E 30,000 IU.3b-Trace elements: E6 zinc (chelate and oxide) 9,000 mg, E1 iron (chelate and fumarate) 8,000 mg, E5 manganese (chelate and oxide) 4,500 mg, E4 copper (chelate and sulphate)2 500 mg, 3b302 cobalt (carbonate) 100 mg, E2 iodine (iodate) 80 mg, selenium (3b8.10 SELPLEX® + E8 selenite) 50 mg. 3c- Amino acids : 3.2.3 lysine HCl 23,000 mg, 3c301 DL-methionine 12,500 mg ; Analytical constituents : Humidity < 10%, raw ash 60%, calcium 11%, sodium 1.4%, phosphorous 6%.